This is the thirteenth of my “Advent Calendar” Christmas ornament posts. For some background information about this project and why I’m challenging myself to complete it, see here. Note: it’s entirely possible some of these memories are inexact, but I’m sticking with them anyway. 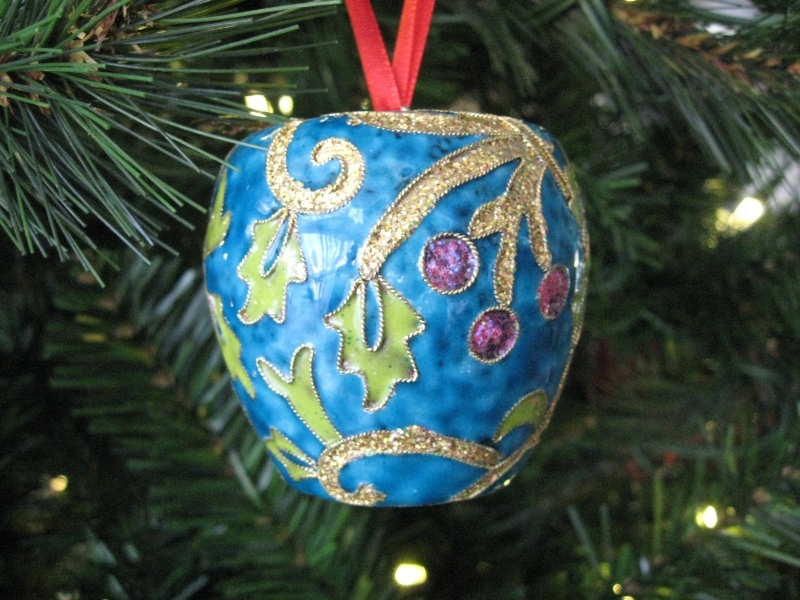 This ornament is an apple. It’s hard to tell, because it’s the wrong color, and only vaguely the right shape. If I tell you it’s an apple, then you can see it, and you’ll say “Oh, of course, an apple!” I had a similar problem with my costume for the Christmas Pageant Where I Was a Beet. We did a pageant every year in elementary school. For weeks, we would rehearse songs and memorize lines. When pageant night came, we’d stand up on long wobbly benches on stage in the cafeteria gym auditorium in front of everyone and endure flashbulbs and overzealous parental applause. One year, for some reason, it was decided that my grade’s contribution to the pageant would be a song and dance routine in which we would play the role of vegetables, stored in the barn over the winter. I don’t remember the details, except that the song was in French and we did a sort of happy square dance, celebrating winter. We were winter vegetables, of course, so nobody got to be anything fun like lettuce or green beans. I was to be a beet. My friends got to be onions and carrots and potatoes, and I was jealous. Those were edible veggies. Nobody liked beets except my weird Dad who liked the little pickled ones that left his fingers purple and his breath vinegary. After assigning vegetables, the teacher rolled out fabric for our costumes – white crinkly paper. That kind that all huge elementary school banners are made of. The kind that gets drawn on with thick, opaque “gouache” paint and fat brushes. We each got a big square of paper to outline our vegetable on. The teacher had a book of cartoon vegetables for the picky eaters among us to refer to in our artistic endeavors. We each drew our vegetable, then mixed paint to the right shades and slopped it onto the paper. When the paint was dry, we cut out the shape with our green plastic round-tipped scissors, then traced it to make a second identical shape to use as the back. The two halves got stapled together and stuffed with crumpled newspaper to make awesome 3D turnips and squashes that would hang around our necks on loops of twine. I felt better about my beethood when I saw how the potatoes turned out. They looked like lumpy poops. On the night of the pageant, students lined up in the hallway according to grade, and fidgeted in our dress shoes. There was much shushing. When the previous class was approaching the end of their performance, my teacher led us into the dark gym. Single file, along the wall. Parents sat in rows of folding chairs lined up in the center of the room. Some turned to look at us as we walked past, because our costumes crinkled. We got to the stage and waited in the wings. The “wings”, for our purposes, meant the run of seven stairs and the tiny landing, stage left. The previous class sang their last note, the crowd clapped, and one of the tall Grade Six kids pulled on the rod to close the accordion curtains. There was a whispered commotion as the teachers ushered the other class out via the tiny landing and seven stairs, stage right. We were given the signal to take our places, and the curtains opened again. Time to be a beet. Opaque white tights and horrid florals were in fashion. I was not raised Mennonite. This entry was posted in Life and Family, Thoughts & Opinions, Uncategorized and tagged Christmas, holidays, ornament challenge on December 13, 2012 by antijen. In fifth grade the theme was peace and we sang “Une Colombe” and “Wind Beneath My Wings”. Another time I remember singing Feliz Navidad but can’t remember when that was…. And also remember having to play the jingle bells instead of the xylophone which I really really really wanted! I remember having to fold SO MANY paper cranes for that “peace” pageant. I think I can fold them in my sleep now!